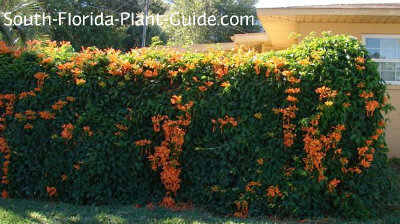 Florida flame vine puts on a spectacular show of fiery color during winter and spring. 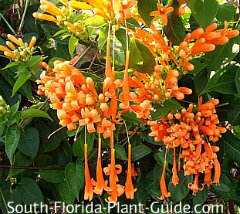 The stunning orange flowers grow in clusters, usually along the top of the vine, and they attract hummingbirds. Flame vines grow in full sun to partial shade, though they bloom more heavily with more sun. This vine leaves most fast growing vines in the dust - it's that vigorous. It will cover a long fence in a hurry - or anything else for that matter. Give it plenty of room because it can (and will) climb over anything in its path - shrubs, trees, the house, you name it. These vines have been known to completely cover and eventually strangle trees, so use good judgment in planning for mature size. "Right plant - right place" is the key to enjoying this beautiful vine for years to come. And the upside of its growth rate is fast coverage...and less plants to buy for a fence full of flowers. This plant is a rampant grower that flowers best in full to part sun. It's cold hardy and does fine anywhere in South Florida. When planting in rows to cover a fence, place plants 4 to 6 feet apart. 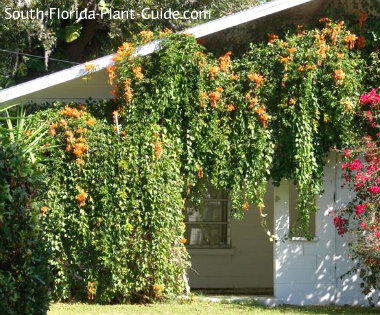 Allow 8 feet (more if possible) between this vine and its nearest neighbor - palms, shrubs, telephone poles, and so on. No soil amendments are necessary, though you can add some top soil to the hole when you plant to help the rootball retain water as it settles into its new home. Prune this vine hard in late spring or early summer once flowering is over. Be prepared to trim as needed to keep the vine from overtaking other things in your yard. 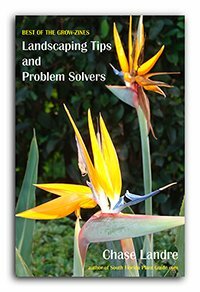 Fertilize once or twice a year in spring and/or fall with a good granular fertilizer.